Subscription based support for companies that lack the full knowledge, capacity and time to dedicate the necessary attention to the different treasury processes. Zanders’ Treasury Continuity Service is for companies that face the financial complexities related to their international footprint, but do not have a specialist treasury department in place. The service is also relevant to companies that lack the full knowledge, capacity and time to dedicate the necessary attention to the different treasury processes, which can leave them exposed to unknown financial risks and costs. Foreign exchange volatility can unpleasantly surprise you if exposures are not identified, measured and managed properly. Funding costs can substantially be reduced by adequate cash management and cash flow forecasting. The Treasury Continuity Service provides hands-on support and advice to improve the standard of your existing treasury processes, through a subscription-based model. It’s a flexible and cost-effective way to raise the professional standard of your treasury function and ensure the continuity of your treasury processes. By sharing our expertise and in-depth knowledge, Zanders consultants will help you stay ahead of the latest developments and regulatory changes. You pay an agreed monthly subscription fee according to how many support days you need each month. The implementation of a sophisticated Treasury Management System, FIS’s (formerly SunGard) Integrity™ SaaS solution, is part of the Treasury Continuity Service. It enables you to optimize, automate and control your often critical treasury processes. The system fees are all included in the monthly subscription fee of the service. Together with Zanders, FIS pre-configured the system to ensure a quick and easy implementation and on-boarding process. Do you already have a Treasury Management System? You can continue with your existing Treasury Management System. Part of the service is that Zanders will review the use of your existing system. Many systems are not used to their full extend, while the license and maintenance fees are paid. Improvement of the use of your Treasury Management System will result in more efficient treasury operations processes. Treasury departments often rely on one or a small number of people, while the impact of treasury can be substantial. This risk is mitigated by the Treasury Continuity Service. Running and enhancing treasury processes at the same time is challenging. Therefore flexible use of capacity is offered with the Treasury Continuity Service . It is challenging to stay up to date with new regulation, especially if you have limited resources available to judge on the impact of regulation for your company, but you want to stay compliant with regulation . Treasury knowledge is kept in the heads of people. This makes treasury very reliable on these people, while the impact of treasury can be substantial. This risk is mitigated by the Treasury Continuity Service. 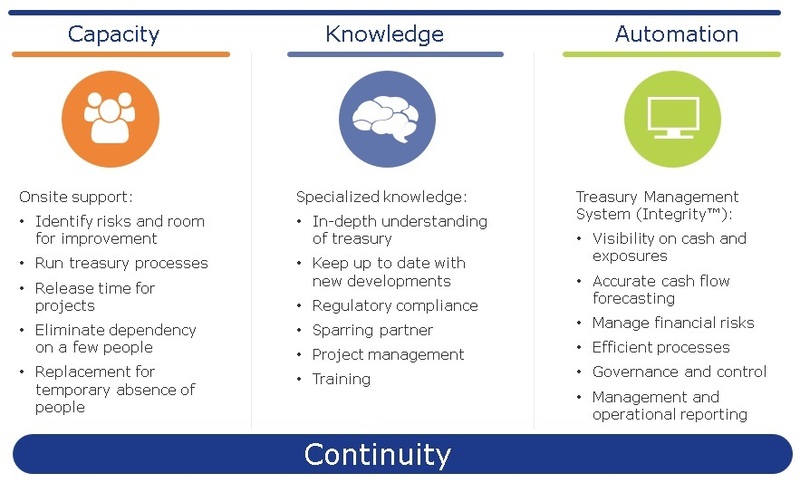 The expert knowledge on treasury, but also the skills on running projects are made available via the Treasury Continuity Service. Automation and standardization are key to gain better control of your often critical treasury processes. Companies move away from Excel based processes towards work flows supported by their Treasury Management System. Because it is flexible and easy to work with, Excel is often used by companies to deal with treasury data and reporting. There are disadvantages however. Mistakes are easily made, formulas can accidently change, an audit trial is not available and only the creator of a file fully understands the working of it. It is therefore risky to rely on Excel when it comes to critical treasury processes. Therefore the Treasury Continuity Service comes with the implementation of a Treasury Management System, FIS’s (formerly SunGard) Integrity™ SaaS solution. The Integrity SaaS solution is a simple, yet functionally powerful, fully cloud-based treasury management solution. The Integrity SaaS solution can manage both simple and complex treasury requirements. Including cash positioning and forecasting, bank account administration, payments processing, foreign exchange, debt and investment management. As well as accounting and reporting. Interested in Treasury Continuity Service? Get in touch with Lisette Overmars or Laura Koekkoek for more information about Treasury Continuity Service. Yes, I would like to get in touch for more information about Treasury Continuity Service.